Money can’t buy you happiness. And a weekend well spent with this chirpy bunch of youngsters may just attest the point. Singing, dancing and exchanging ideas — all this and more. This is the way of life for the Manzil brigade. This youth-driven organisation, which aims to nurture and hone the creative strength of youngsters by providing them an informal and open ‘meeting ground’, thrives on team spirit and a culture of camaraderie. Every Sunday, the zesty Manzil volunteers from across the city gather in and around the swish Khan Market for various adda sessions. 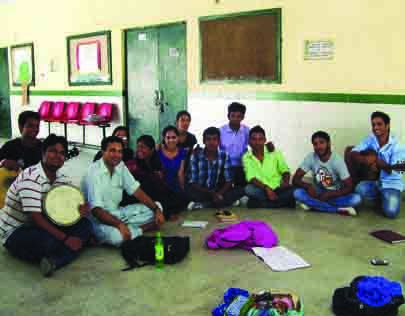 Many are here to take classes in their favourite art forms — dance, theatre and music. For others, it’s a good time spent in the company of friends, brainstorming on burning issues. Everyone is welcome here. Condition: just leave your egos outside. So, young theatre activist Abhinav Sabhyasachi, along with his friend Rohit Kumar, both from the Paltan theatre group, are among the regulars. Post a practice session, before calling it a day, the team settles down at any of the nearest Metro stations for a tête-a-tête and each member leaves with a thought for the week ahead. Abhinav finds planning a play with Manzil group exciting. He tells us why. “We often go without a script and even without a storyline. The story has to be about an issue that concerns us. The dialogues are often anecdotal and the discussion generated after a play is very significant for us. We try to look for answers and deliver a message,” he says. Through their group “Drame Baaz”, the group comprising students, professionals and artists make plays to address various social issues. “Along with practicing myself, I also teach here now. This is a lifelong association for me,” he says, as he strums a tune and the Mystics break into song. Another member of the Mystics, Reshma, 27, adds, “In spite of our busy schedules, we make time to come here and keep on learning new things. I have just started taking Kathak classes,” says Reshma, who is a professional nurse and just returned from a year-long scholarship-based course in the US for which she credits Manzil for “showing her the way”. Her friends are all ears as Reshma narrates stories from the foreign land. As he sits during the practice session, laughing and cracking jokes in the school corridor, founder, Manzil, Ravi Gulati says, “We are like gardeners who nurture the seeds. We don’t believe in factory schooling or regimentation,” he says. Manzil was originally the brainchild of Ravi’s mother. While she was taking care of his sister who had multiple handicaps, she ended up volunteering for 30 years with children with special needs. Sparked by that, she opened a school for children with special needs in Kotla Mubarakpur after she lost her husband to a terminal illness. “As for me,” says Ravi, “that was when I was sorting things out for myself. It so happenned that two children, one a gardener’s son and another a washerman’s, came to me seeking help with maths and within a week I had around 20 children of different age groups and this became Manzil,” he says. Apart from creative classes, the organisation also runs Maths, Computers and Spoken English classes of various levels through the week. “Although most of the students in Manzil come from non-affluent backgrounds, we are not intended for only a certain group or section of society,” says Geetika Kapoor, director, Manzil. Meanwhile, as Anikit finishes his song, he breaks the good news that he has his bags packed for his dream trip to the US for a course. “I would have never known about this opportunity had it not been for Manzil. I hope this course gives me a new perspective towards life,” says Ankit who’s a trained chef and sees music as an alternate career option. And to wrap up, Ravi tells us why lower-income kids should not be slotted as underprivileged. “There are many dimensions of privilege. From another angle, they are privileged because they are independent. They can think and take their small decisions and enjoy simple pleasures of life like taking a bus from the other end of the city to gather here and pursue their passion. It’s not always about money,” he signs off.